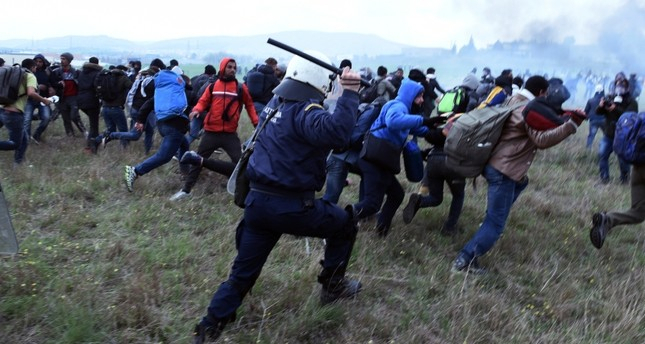 Greek police clashed on Saturday with groups of migrants and refugees camped in a field close to the country's northern border hoping to cross to neighboring countries and travel onward to northern Europe, witnesses said. They were prompted by reports on social media of plans for an organised movement to cross Greece's northwest land border with Albania in early April. Riot police fired teargas at dozens of people - some with children in their arms - who threw stones and bottles as they tried to break a police cordon and reach a road leading to the border. About 100 tents were pitched in the field which was heavily guarded by police. People refused to leave despite calls by ministers to return to accommodation centres and warnings that onward travel would be impossible. "It's a lie that the borders will open," Migration Minister Dimitris Vitsas told Greek state television ERT on Friday.